'Status of Women' refers to the position of women in society in relation to men. Although, geographically, men and women share the same space, yet they are not treated equally in the world. In reality, there exists inequality in women’s access to education, health care, physical and financial resources and opportunities in the political, economic, social and cultural field. Everywhere in the world, women are accorded a lower status than men. I was fortunate enough to have a family who provided me good education but I never got an opportunity to work. In the working field or in terms of setting up their own business, women face greater barriers that are hard to overcome. They are often confronted with a lack of government support in terms of policy, laws, and services, and in some countries have only limited access to formal bank accounts, which prevents them from accessing loans or credit. Lack of education, skills training or career guidance only adds up to the difficulties. Cultural values can also hold women back. In countries with rigid views of traditionally male and female roles, frequently reinforced by cultural and religious beliefs, women’s opportunities for engaging in paid work or starting up enterprises are often limited. At the same time, perceptions of family responsibility pose a challenge, with patriarchal attitudes restricting women’s responsibilities to domestic and family work, and thus preventing them from acting independently. In both developed and developing countries, a common intervention to improve pay and working conditions is implementation of equal opportunity or anti discrimination legislation. This includes family leave policies, equal pay and equal opportunity laws and policies, and legislation guaranteeing rights at work. The Securities and Exchange Board of India (SEBI) issued a notice to have at least one woman director on the board. According to the TOI-commissioned study on the relation between companies with women on their boards and profitability, the board of a private sector company, run by a professional CEO with a mix of both men and women, helped ROE rise by 4.4% in 2014 over the last year. In contrast, a similar company with a men-only board saw its ROE rise by a mere.1.8% in the same period. ICICI Bank, headed by Chanda Kochhar, has shown a positive difference on return on equity. 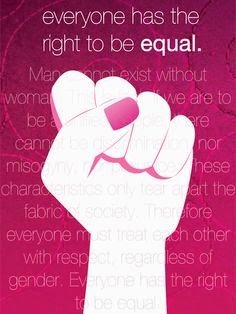 For creating gender equality through empowerment, safety and well-being of women is very important. According to FICCI, with women representing 24.4 per cent of the total workforce in India, personal security has become central to their physical, intellectual, emotional, economic and spiritual well-being. 24x7 operational CCTV cameras should be installed at vital locations. Also Identification Documents should be collected from drivers, security guards and all casual staff. Organisations should adopt a "Zero Tolerance Policy" and clearly state that sexual harassment will not be tolerated by the company. The policy should explain that it not only applies to the workplace during normal business hours, but also to all work-related social and business functions, whether on or off the company's premises, and also while employees are on business-related travel. They should encourage employees to report harassment. Women in India face enormous challenges for their participation in the economy, especially their domestic duties that include childbirth, caring for the young and old, cooking, and a range of other activities that are crucial for the upkeep of the family. “Many companies assume that a working mother is not a long-term asset—that they are not likely to stick around even after returning from maternity leave,” said Persis Sidhwa, a lawyer at Majlis, a non-profit organisation in Mumbai, which works for women’s rights. There are also companies where women still have to face discrimination and harassment when they announce that they are pregnant. In Fact, the number of women, who have no choice but to leave work after childbirth because of lack of rights, childcare and other facilities, is alarming. Female employees should be entitled to a maximum of 12-14 weeks maternity leave. Also, employers should provide nursing breaks of prescribed duration for new mothers in order to express breast milk for nursing child. Child care centers, work from home, babycare room etc are few more facilities that can be provided to make working mother's job easy. There is a blogging competition held by http://shethepeople.tv/ on "Women in Leadership". Take part and support this cause for yourself and for other women. You can participate here: http://shethepeople.tv/leadership-contest/ and even win an all paid expense to an exciting destination.